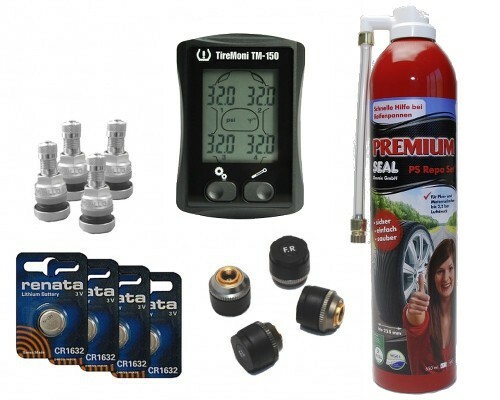 Bestseller package deal: TireMoni TM-150-NST direct tyre pressure monitoring system plus PS-REPA-Set plus 4 metal valves 31 mm plus 4 spare sensor batteries. Attractive and easily readable display. 4 sensors, extended measurement range up to 80 psi. Per axle separately adjustable warning thresholds. Ideally suited for cars or trailers with 4 wheels. Bestseller package deal: TireMoni TM-150-NST direct tyre pressure monitoring system plus PS-REPA-Set plus 4 metal valves 31 mm plus 4 spare sensor batteries. A small, attractive and easily readable display, 4 sensors with extended measurement range up to 80 psi, per axle separately adjustable warning thresholds. Ideally suited for cars or trailers with 4 wheels and maximum cold inflation pressure of 70 psi (allow +20% pressure increase due to tyres warming up). 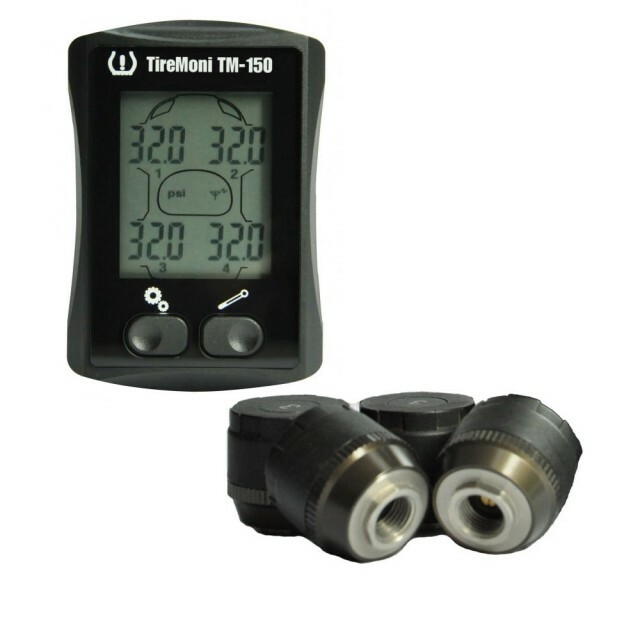 The TireMoni TM-150-NST tyre monitoring system permanently shows all 4 tyre pressures. This gives you the information which makes sure that you are driving with optimum tyre pressure at all times; it helps you save fuel and tyre wear and you can contribute to CO2 reduction and help protect our environment. In case of pressure drop TireMoni will give optical and acoustic warning signals. Increased driving safety is your free benefit. TireMoni can be installed in only 5 minutes and needs not be initialized or programmed; all batteries are replaceable. One set of sensors (only 10g/sensor) is sufficient for summer- and wintertyres; anti theft protection is included in the set as well. High-Tech tyre pressure monitoring at a bargain price. TireMoni: "One look - 4 wheels: a good safety feeling!"